Last week, I went to a rock climbing gym with my friends who climb every week. Unlike them, I am overweight and out of shape. 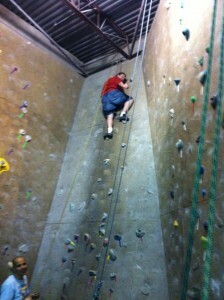 I strapped up and clipped into the belay. Then about three feet off the ground, my fear of heights got the best of me, and I panicked. Thankfully I was there with good friends, who didn’t taunt me or belittle me. I tried again a few minutes later. This time I climbed four feet off the ground before freaking out. Then I tried it again. And again. Every time I panicked. So when my friends said that they had a climb that was easy, I resigned myself to climbing one more time. Suddenly, I was two-thirds of the way up. I could do this. I kept moving, without thinking, until I could touch the pipe on the ceiling. A few days later, I was still sore, and still happy. I did something that I never thought I could do, and I’m a better man for it. Have you ever done something that really scared you? Let me know your story in the comment section.